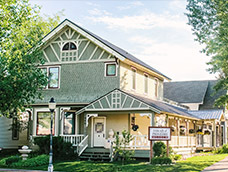 The Tread of Pioneers Museum has created a dedicated kid-friendly exhibit that represents a typical child’s bedroom in Steamboat Springs around 1900. 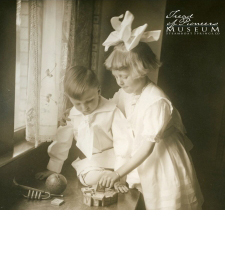 Special exhibit features includes pioneer clothes to try on and historic and replica toys from the turn of the 19th century ready for touching and experimentation including books, blocks, china dolls, teddy bears, porcelain tea sets, stereoscope, and more—all ready for play and interaction. Framed portraits on the wall feature local families and children from the early 1900s. Information and fun history tid-bits on every item in the bedroom can be found within the “Discovery Cards” drawer. Having the information located in a drawer keeps children involved and requires them to seek and find answers--which often leads to better information retention. Another feature of the room includes a drawer of odd Victorian tools no longer in use today. The “What is This?” game includes historical objects for kids to hold, bend, and smell in order to figure out what it is. Some of the items are, glove stretchers, a button hook, garters, hand warmers, and a darning egg.